In Feudal Japan, Renet has snuck off on her own, leaving the Turtles no alternative but to follow Mito back to his master, Oraga, for an audience (much to Raph’s disapproval). Renet, meanwhile, has honed her Timestress instincts (basically, her “woman’s intuition”) and has chosen to go off alone to follow a hunch. She is seized by Chote, but before he can steal the Time Scepter, Renet orders it to vanish. At Gosei Castle, Mito tells the Turtles to stay put until Lord Oraga agrees to see them… tomorrow (much to Raph’s disapproval). At the mysterious shogun’s base, Chote returns with Renet. The shogun is furious that Chote has lost the Time Scepter, but knows that as long as they have the girl, it will be his eventually. Even stranger, the shogun seems to know who Renet is by name. The next morning, Oraga agrees to see the Turtles, though he is not doing well. The shogun’s mystical attacks on his mind have rendered him sickly and weak. Leo is in the process of convincing Oraga to give them a detachment of samurai to raid the shogun’s camp and end his menace, when Oraga is struck by another mental blow from his nemesis, putting him in a coma. Mito sees to his master’s health, but tells the Turtles that he cannot approve their taking any samurai into battle until Oraga recovers… no matter how long that may take (much to Raph’s disapproval). Days pass and Raph finds that Feudal Japan isn’t so bad, especially once he takes a pair of ronin (Oshi and Sato) under his wing. Two more days pass and Leo has waited long-enough. Leo rallies his brothers to storm the shogun’s camp alone (much to Raph’s disapproval). Wait, what? As it happens, Raph is content to stay and train with Oshi and Sato. Or so they think. After dark, Leo makes the discovery that Raph and his two pupils have left on their own. Indeed, Raph, Oshi and Sato arrive at the shogun’s compound first, only to find it burnt to the ground. Oshi suggests that the wizard burned it himself while Sato finds tracks leading toward the mountains. Raph leaves Leo a note in the dirt and then the trio heads off. Inside the caves, the evil shogun has made his new camp with Renet and Chote, impatiently awaiting the return of the Time Scepter. Alone, Renet talks to Chote, who isn’t actually evil but merely bound by bushido code to serve his master. Raph, Oshi and Sato enter the cave, but they’re anticipated by Chote, who attacks. The two ronin are quickly knocked out of the fight, leaving Raph to fend for himself. Luckily, Leo, Don and Mike show up and help him take down Chote. They’re too late, as the Time Scepter returns and the shogun snatches it. 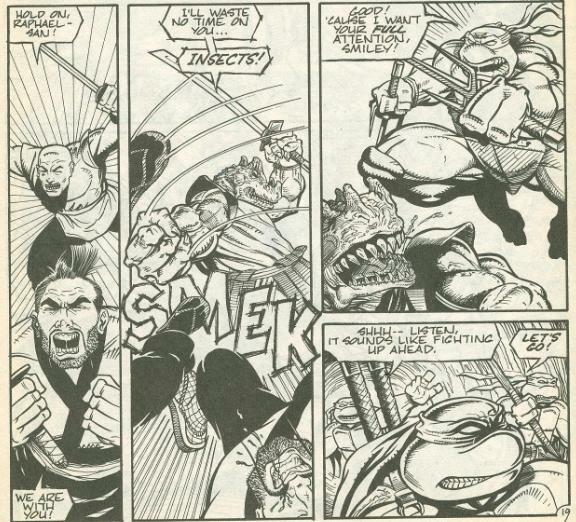 The Turtles attempt to bring him down, but the shogun has become so powerful they can’t even touch him. He then reveals his true identity: Savanti Romero. Apparently, after their last battle, Savanti was frozen in time and left paralyzed at the bottom of a prehistoric lake for thousands of years. He eventually woke up and found himself in Feudal Japan. Knowing that the Gosei Spirit was his only means of affecting time and returning to the future, he began mystically attacking Oraga. That was all Renet needed to hear and the cocky Timestress announces that she’s about to put the next check on her to-do list. Savanti attempts to blast her with the Scepter, but she deflects the energy and banishes him back to the age of dinosaurs (where he’s none too happy). No longer bound by his code of honor, Chote is free to find his own destiny. Renet suggests he go someplace where he might fit in better and sends him to the Omicron Seti star cluster, galactic year 1070 (where he finds himself amongst a gaggle of weird aliens). Lastly, before getting to the next item on her list (that kid with the flying DeLorean), Renet sends the Turtles back home to Northampton (where Hattori has made a full recovery). Back in 1373, Oshi and Sato come to and exit the caves, alone. They swear to never speak of the strange creature that instructed them ever again, but to use what they have learned to form their own martial arts school. And as every journey begins with a single step, they will call their clan The Foot. *This story is continued from TMNT (Vol. 1) #46. The story continues in TMNT (Vol. 1) #48. *Hattori will return in Tales of the TMNT (Vol. 2) #22. *Savanti Romero last appeared in “Spinal Tapped”. He will return in Tales of the TMNT (Vol. 2) #32. 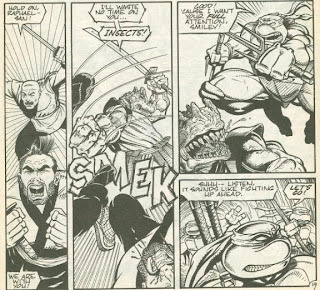 *The Turtles reference their battle with Romero in Tales of the TMNT (Vol. 1) #7 as their last encounter, though “Spinal Tapped” was written to take place after that story, creating a continuity error. *Romero’s wife, Savanti Juliet, last appeared in TMNT (Vol. 1) #42. *The Turtles will encounter Renet again in Tales of the TMNT (Vol. 2) #51. *Fluffy from Michael Dooney’s “Gizmo” series can be seen amongst the weird aliens on the world Chote is transported to. The opening editorial promises that Dooney will be using Chote again in future stories, presumably in his “Gizmo” series. Alas, those plans never materialized and Chote isn’t seen again. *This issue also contained an 8-page bonus “Space Usagi” back-up by Stan Sakai, “Hare Today, Hare Tomorrow”. Michael Dooney’s “Masks” comes to a conclusion, but it does so with something of a whimper, I’m afraid. It spends a lot of time spinning its wheels as the Turtles wait for Oraga to see them and Romero waits for the Time Scepter to come back and most of the issue is just spent… waiting. Lots and lots of waiting. Even Raph’s training of the two ronin only amounts to a few pages and neither Oshi nor Sato receive any characterization or personality. The origin of the Foot Clan made for a great ending stinger, but it seems tacked on as an afterthought (most of their training under Raph ocurred off-panel). And what the heck did Renet do for the five or six days everybody spent sitting around waiting? Was she in a prison cell? Was she tortured? It is never addressed. In fact, while the narrative boxes make sure to tell us that many days are passing while the Turtles are at Oraga’s, Renet’s time at Romero’s camp seems to be passing by at a different speed (unless it really took Romero a whole day to have Chote bring Renet through the door to speak with him). The showdown with Romero is also a major let down. It’s amusing to know that Renet was merely “playing possum”, waiting for Romero to make the mistake of revealing himself, then cast him back to prehistory without even an exertion of effort, but that still makes for an underwhelming climax. Romero has always been a villain played for laughs, yet there’s no humor to him in this storyline. Dooney characterizes him as deadly serious and intimidating, too, which is unfortunate. Without the edge of humor to make him a bumbling villain, Romero simply rubs off as obnoxiously incompetent and a waste of everybody’s time. I’m not opposed to a serious interpretation of Romero, just don’t defeat him in a page and a half because he presents no genuine threat. What saves this half of “Masks” is the art by Dooney, which is of his usual excellent quality. Even though the majority of the issue is spent with the characters waiting around, doing nothing, it’s still pretty to look at. And while the climax with Romero was a waste, the battle with Chote in the cave was pretty sweet (and especially interesting is that Don delivers the finishing blow, not Raph or Leo, the two focal Turtles of this story). The second half of “Masks” doesn’t quite live up to what the first half promised. There are a lot of good ideas in here, but none are given time to develop. We get the origin of the Foot Clan, but we learn nothing of the founders and the “training” delivered by Raph is mostly unseen. Romero makes his big comeback, but is defeated a page after he does so. Hattori comes back after being absent from the series for years, but spends the whole thing sick in bed. Chote is sent to live in the future world of “Gizmo”, but Dooney never utilizes that plot thread in any “Gizmo” comics. In the end, you’re just kind of left wondering what all really happened in this story arc besides a whole lot of pretty art. The ending doesn't make any sense at all. If the Foot Clan was in fact created by Oshi and Sato after being trained by Raph, then the Foot wouldn't have existed in the actual (present day) continuity of the entire book! That would've meant every single issue including the Foot up to this story arc was an altered reality. So Michael Dooney basically retcons the complete Mirage universe if this story is considered canon. Of course ANY explanation could be given in regards of altering the Foot's origin without any changes being made to the present day timeline of events, but that would simply render this ending irrelevant. In that case, Raph's entire sub-plot - as insignificant as it was anyway - is a total waste of... well, everything. And if it did change anything in the continuity as a whole, it may only surface in the issues to come, since by the time the Turtles get back in the present day THAT reality is altered by them visiting Feudal Japan. So any events taken place before this issue may not even have taken place after all - RETCON AGAIN! Of course, if it would've been Dooney's intention to reset the Mirage universe, the time travel thing would be the perfect way to do so, as it basically messes up everything anyway. But as far as I can puzzle together from my knowledge of the Mirage series, it appears no attempt was made to deliberately reboot the universe. Michael Dooney may be one of the best artists ever to draw a Turtle comic, but it seems he didn't really think this through. Then again, it still wasn't as half-baked as the third Turtles movie. In regard to the above poster time travel and Turtles never really has to make sense. Since at the end of the day its a book about Mutant Turtles that exist in a world where superheroes, time travel, and alien invasions are as commonplace as popping out to the store to buy a gallon of milk. Things happen and unless the Shredder is involved very rarely do they have any lasting consequences. Now in regard to the issue. I personally am a huge fan of Raphael being the catalyst that influenced the creation of the Foot Clan. It just seems so poetic to me. Even if, as stated, it seems to have been tacked on as an ending stinger and not planned from the start. 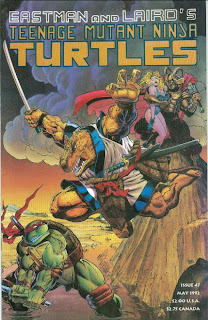 Especially considering Raph would go on to lead the Foot Clan in the Image books. It all tied together nicely on a quantum level and made me smile. End of the day its all non-canon anyway. The question I always had was if this was meant to be a longer story. Part One of Masks is such an amazing set up and its sad to think Dooney came up with such a great premise only to have it nicely tie up the next issue. I wonder if Shades of Grey (Gray?) and the start of City at War were part of the reason it resolved so quickly. Predestination Paradox. The Foot Clan were started by Raphael who went back in time, who layer went on to fight Raph in present times. Nothing is really changed because they had already done it. It works. Sure I like the idea of Raph being a catalyst of the Foot as well, especially since he became the Shredder later on, but the way it was poorly executed. I also agree it's a pity a great set-up ended so neat yet unsatisfying. But that's time travel stuff, I guess. PS: Brilliant artwork, even though Leo looks like a giant on the cover.